chronological: Countdown << Alley Viper >> T.A.R.G.A.T. Notes: DiC's Alley Vipers wore the 1989 outfit, with a solid blue vest and a solid orange visor with no Cobra logo on the front. 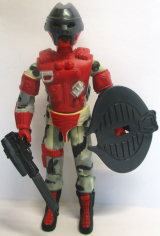 The one featured in Operation Dragonfire always wore his visor up. Accessories: black bullpup-style machine gun with scope (new), orange and blue X-shaped face shield with Cobra emblem (new), orange and blue jagged shield with Cobra emblem and handle (new), black backpack with engraved grappling gun (new), black two-clawed grappling hook for backpack (new). The ALLEY VIPERS are the Cobra equivalent of a police S.W.A.T. unit or British S.A.S. (Special Air Service). They form the spearhead of Cobra's inner-city invasion forces. This elite contingent of marauders are true masters of brutality, possessing a style of ruthlessness not present in other Cobra soldiers! Recruited from Cobra's most diabolical combat divisions, Alley Vipers use various forms of treachery to achieve their objectives! In order to graduate from their training program, they are required to survive a full burst of machine gun fire across their frontal body armor, execute a thirty foot jump onto concrete with full combat load and run down a hundred meter gas-filled corridor without a gas mask! "Alley Vipers are big and strong as well as ruthless! Their body armor alone weighs 50 pounds and they carry at least 30 pounds of weapons, ammo, grenades, and climbing gear. You definitely don't want one of these gorillas running up and kicking your door down!" Toy Notes: Item #6529. 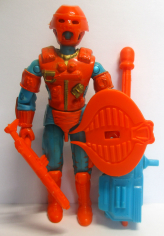 The prototype shown in the 1989 insert catalog has a plain orange shield. Accessories: black rifle (86 Dial-Tone's), black machine gun (89 Alley Viper's), yellow boxy spring missile launcher with short grip and black trigger (new), two black spring missiles with bulge behind round caplike tip (new), black mask with pointed crest and catlike fangs (new), black shield shaped like Cobra emblem (new), black backpack (89 Alley Viper's), black grappling hook (89 Alley Viper's), black figure stand (common). The ALLEY VIPERS are an elite contingent of ruthless marauders and true masters of brutality! Despite their destructive powers and feared reputations, Cobra was dissatisfied with them and recently outfitted a new breed of Alley Vipers that made the old ones look like nerdy wimps! Extensive physical and terrorist training programs are standard for these vicious Vipers and they soon become skilled villains and dangerously full of hate. You definitely don't want to invite one of these gorillas to dinner...or anywhere else! Motto: "We aren't afraid of taking over ANY city...except maybe some parts of New York." Accessories: orange rifle (86 Dial-Tone's), orange machine gun (89 Alley Viper's), blue spring missile launcher with orange trigger (93 Alley Viper's), two black spring missiles (93 Alley Viper's), orange mask (93 Alley Viper's), orange shield (93 Alley Viper's), orange figure stand (common). 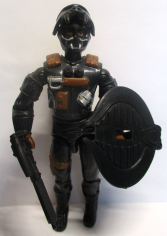 Accessories: black rifle (86 Dial-Tone's), black mask (93 Alley Viper's), black shield (93 Alley Viper's), black figure stand (common). Alley Vipers are the Cobra equivalent of a police S.W.A.T. unit or British S.A.S. (Special Air Service). They form the spearhead of Cobra's inner-city invasion forces. This elite contingent of marauders are true masters of brutality, possessing a style of ruthlessness not present in other Cobra soldiers. Recruited from the most diabolical combat divisions, Alley Vipers use various forms of treachery to achieve their objectives. In order to graduate from their intense training program, they are required to survive a full burst of machine gun fire across their frontal body armor, execute a thirty foot jump onto concrete with full combat gear, and run down a hundred meter gas-filled corridor without a gas mask! Alley Vipers are big and strong, as well as fierce looking. Their body armor alone weighs 50 pounds and they carry at least 30 pounds of weapons, ammo grenades, and climbing gear. If you hear the roar of their Rage tanks coming down your street, lock all your doors, and hope they are passing by. If you hear knocking at your front door, don't expect it to be the pizza guy! Motto: "We take every city by force." Toy Notes: Boxed with a Toys 'R Us-exclusive recolor of the Cobra Rage. Item #28008. The prototype shown on the box back lacks white camouflage and appears to have the 1989 version's head and visor. Accessories: black pistol (85 Tomax's), blue mask (93 Alley Viper's), blue shield (93 Alley Viper's), black backpack (92 Big Bear's), black figure stand (common). The COBRA ALLEY VIPERS are the inner city invasion forces for COBRA. Recruited from other COBRA combat divisions, ALLEY VIPERS use various forms of evil to achieve their objectives .They go through extremely tough training in all kinds of urban environments—streets, buildings, and alleys. Only the toughest can successfully jump down thirty feet to a concrete floor while carrying a full combat load—and that's just one of the easy exercises. They look and act tough, so people are always running away, just at the sight of them. But BIG BEN from the G.I. JOE team did not run—he fought them and sent them packing. Now they live for the day when they can show him that they are the superior fighters. "We're big, strong, and ruthless! You don't want to be around when we come kicking your door down." Toy Notes: Carded in a two-pack with Big Ben. Item #57480. Accessories: graphite pistol (85 Tomax's), graphite mask (93 Alley Viper's), graphite shield (93 Alley Viper's), graphite backpack (92 Big Bear's), graphite figure stand (common). Toy Notes: Carded in a two-pack with Big Ben. Item #57445. 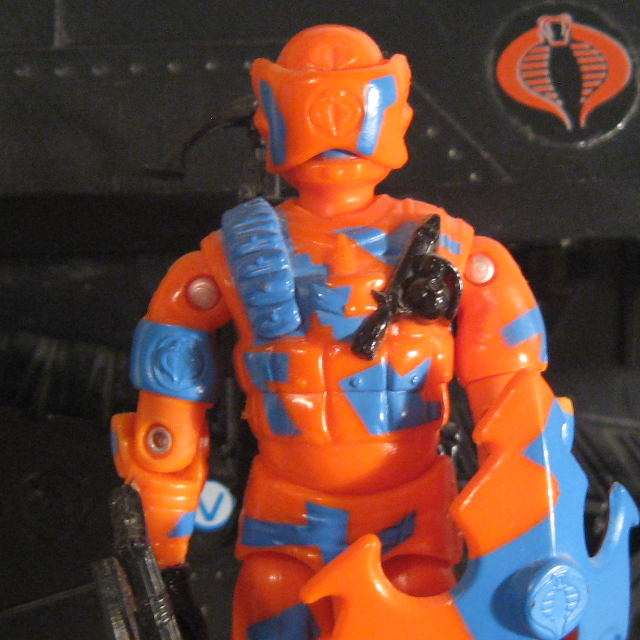 The COBRA ALLEY VIPER troops are the inner city invasion forces for COBRA. Recruited from other COBRA combat divisions, ALLEY VIPERS use various forms of evil to achieve their objectives. They go through extremely tough training in all kinds of urban environments—streets, buildings, and alleys. Only the toughest can successfully jump down thirty feet to a concrete floor while carrying a full combat load—and that's one of the easy exercises. They look and act tough, so people are always running away just at the sight of them. But BIG BEN from the G.I. JOE team did not run—he fought them and sent them packing. Now they live for the day when they can show him that they are the superior fighters. "We're big, strong, and ruthless! You don't want to be around when we come kicking your door down!" Toy Notes: Carded in a two-pack with Cobra Viper. Item #56900. Accessories: black pistol (85 Tomax's), black mask (93 Alley Viper's), black shield (93 Alley Viper's), black backpack (92 Big Bear's), black figure stand (common). 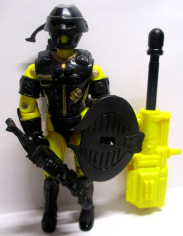 The COBRA ALLEY VIPER troops are the inner city invasion forces for COBRA. Recruited from other COBRA combat divisions, COBRA ALLEY VIPER troops use various forms of evil to achieve their objectives. They go through extremely tough training in all kinds of urban environments—streets, buildings, and alleys. Only the toughest can successfully jump down thirty feet to a concrete floor while carrying a full combat load—and that's one of the easy exercises. They look and act tough, so people are always running away just at the sight of them. They have been given special training in controlling the dangerous human-animal tiger hybrids created by DR. MINDBENDER, for one side effect of the experiments has resulted in uncontrollable bursts of frenzy. Amongst themselves, the COBRA ALLEY VIPER troops refer to the hybrids as their new attack dogs. Toy Notes: Carded in a Toys 'R Us-exclusive set with Firefly, Cobra Nullifier, Storm Shadow, Night Creeper, and Scrap Iron. Item #53913.